Circle F Farms has been built on superior females and proven cow families. Our initial female purchases were from the legendary V8 and J.D. Hudgins Ranches with many of the cows roaming our pastures today being flushmates to their champions and popular donors. 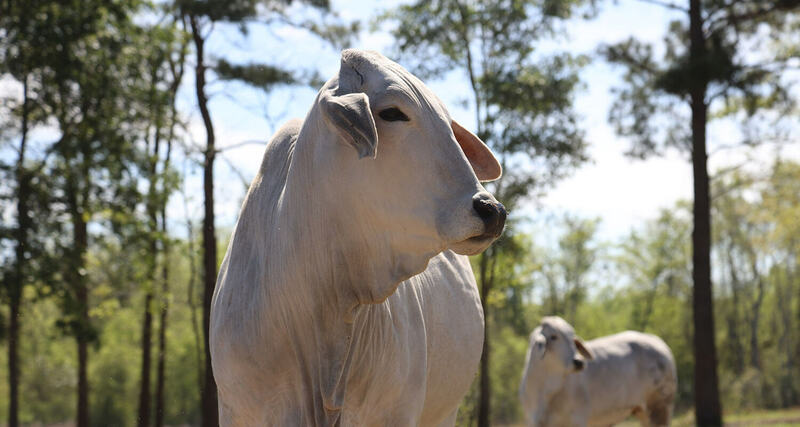 Although we run close to 300 Registered Brahman cows we are very selective when assembling our donor roster with an emphasis placed on quality and production. Our donors are selected based on their production, pedigree, and phenotype. Not only is it important that these females are eye appealing with proven pedigrees, but they must produce. Only after a female has calved regularly twice and weaned a heavy calf of superior quality will we consider her to be a donor. It is our obligation to our customers and the beef industry that we breed functional, efficient and productive cattle. For us to meet this obligation we must use the most proven and elite females in the breed. This elite young donor was one of our top picks in the purchase of the Fall 2012 Heifer Crop from J.D. Hudgins, Inc. She combines one of the most maternally oriented pedigrees in the breed consisting of 4 Vanguard and 1 Maternal Performance Sire. The influence of her pedigree, her own performance and that of her offspring validate that she is truly a “curve bender” being low birth weight and high growth only adding to her versatility in the herd. JDH Lady Rancho is sired by the National & International Champion and leading sire of champions for J.D. Hudgins and breeders around the world, +JDH Woodson De Manso 206/7. The dam to 372/8 combines two of the proven maternal lines of J.D. Hudgins, Inc. combining +JDH Lawford Manso & (+)JDH Datapack Manso. We are extremely excited about the versatility of JDH Miss Rancho Manso 372/8 and what she can add to our program and ultimately the breed. 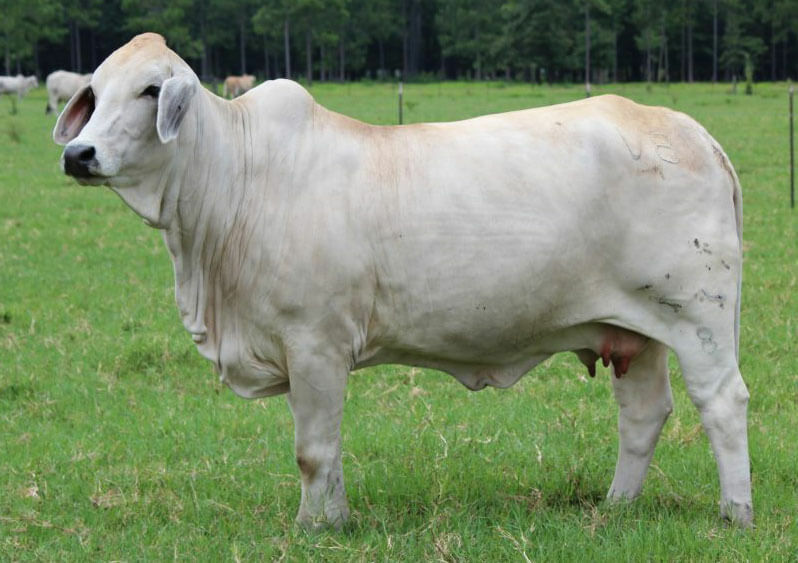 Brahman enthusiasts will read the pedigree of this top young donor and realize that she is a full sister to the National Champion and two time International Champion Miss V8 21/8 “Boom Shakalaka”. We were extremely excited to be able to purchase two females of this same mating from V8 Ranch. Not only is Miss V8 69/8 a full sister to what could be one of the greatest females in the breed but she is a daughter of +Mr. 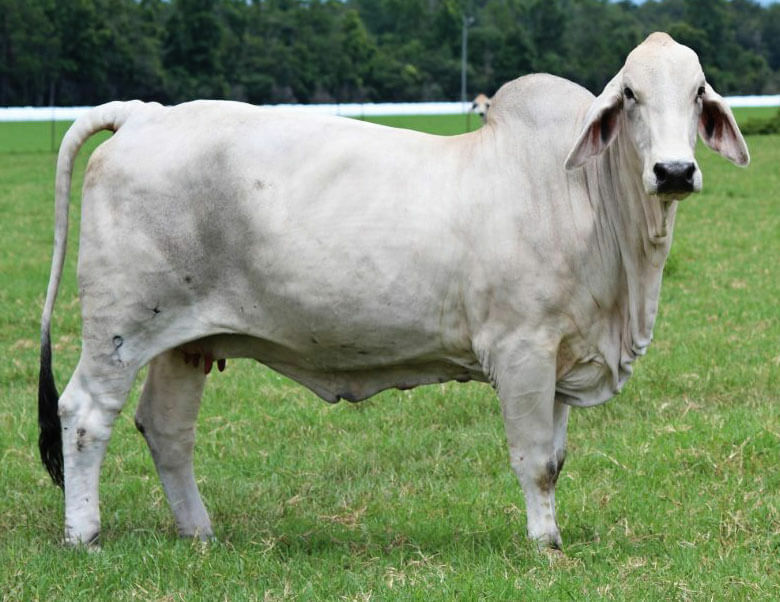 V8 380/6 who produced more champions than any other bull from 2011-2016 and out of +Miss V8 382/7 the 2013 International Champion Grey Female. There simply is not a pedigree that combines more purple banner winners, as confirmed with 10 Register of Renowns, than this one. There is no question that we like cattle that have showring appeal but understand that our cattle must meet the expectations of our customers. Miss V8 69/8 certainly doesn’t miss the mark as she ranks in the Top 1/3 of the breed for 10 traits! We think this female has the potential to be one of the “matriarchs” of our program. This beautiful dark pigmented, big bodied, deep ribbed, heavy muscled, big boned female is a flushmate to Miss V8 21/8 “Boom Shaka Laka” the National & Two-Time International Champion for V8 Ranch. She is sired by +Mr. 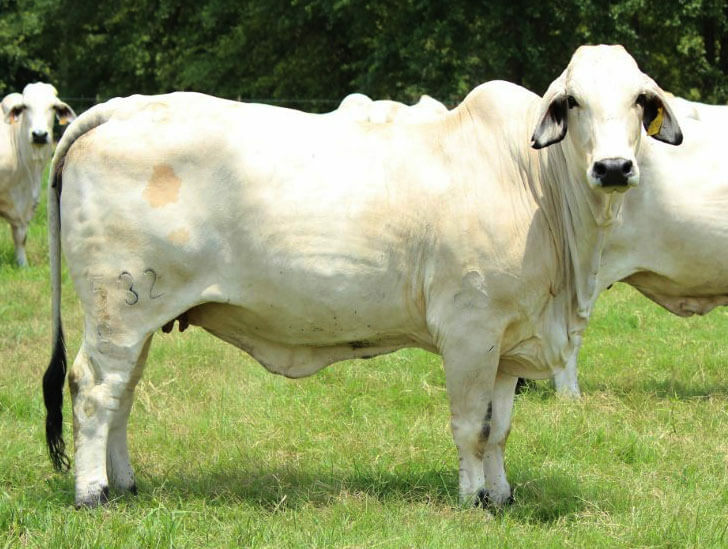 V8 380/6 who is one of the most proven sires in the Brahman breed as validated by him producing more show ring winners in the USA from 2011-2017 than any other sire. The dam to 23/8 is equally impressive having been named the 2013 International Champion and is now a proven producer. In addition to her proven pedigree and “eye catching” phenotype Miss V8 23/8 offers a performance profile that ranks in the top 3% of the breed for the economically relevant traits of WW, YW, Ribeye Area and 10% for Marbling. With the marketability, eye appeal and performance offered in this female we are extremely excited about the role that she will play in the foundation of our program. Combining Performance & Production! We simply could not have asked for any more when we were able to purchase Miss V8 24/8. She is sired by the multi-trait leader, former show winner and proven sire +Mr. V8 442/6 making her a half sibling to Mr. V8 259/7 among many other notable breed leaders. The dam to 24/8 is a Maternal Merit Cow that is a daughter of the Maternal Performance Sire and multi-trait leader (=)JJ Cuatro Didor 919/1. As you might expect with this pedigree Miss V8 24/8 ranks in the top 10% of the breed for 8 traits including the top 1% for WW, YW, Milk & Marbling. With a production oriented pedigree, breed leading performance measurements, and an eye appealing feminine look this top female will be one that can be crossed with a number of different sires to produce offspring that will fit all segments of the industry. Maternal Influence Extraordinaire! 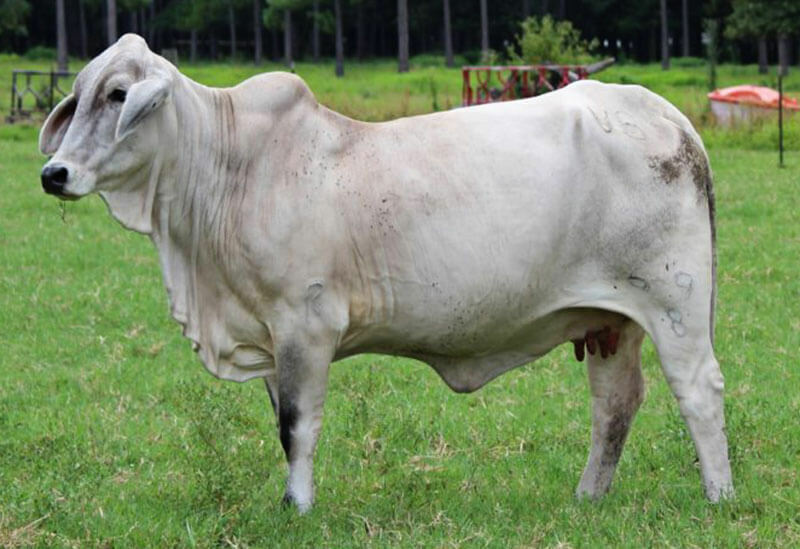 Miss V8 59/8 combines some of the most proven maternal genetics in the Brahman breed. Her dam is a cross of the Maternal Performance Sire (=) Mr. V8 332/4 who is still an influencer in the V8 cow herd after 20 years and the National Champion and producer of Champions, +JDH Marri Holly Manso 50/6. To complete this impressive pedigree is the proven sire of champions and performance cattle alike +Mr. V8 380/6. As you might expect with this maternally driven pedigree 59/8 has the look and performance to validate her parentage. She ranks in the top 1% of the breed for WW, YW & REA as well as the top 2% for milk and 10% for Marbling and Scrotal Circumference. With this pedigree, performance indicators and productive build she should produce offspring that will be fast growing, early maturing, heavy milking, and offer the proven carcass traits appreciated by the most discriminating cattleman. Miss V8 64/8 combines some of the older but most proven genetics at V8 Ranch. She is sired by JDH Mr. Manso 288/1 who sired some show winners for V8 but most importantly some of their most proven cow lines. The dam to Miss V8 64/8 is a cross of the International Champion, multi-trait leader and global icon +JDH Karu Manso 800 and +Miss V8 983/3 who has been one of the leading donors for V8 producing 4 herdsires and countless donor dams including +Miss V8 653/6 the dam of the International Champion Mr. V8 846/5 “The Rock”. Not only does 64/8 combine some of the most proven maternal genetics in the breed but she is also double bred (+)JDH Dakota Manso the Vanguard sire who has long been recognized as one of the superior performance bulls in the breed. As a result of her performance packed pedigree 64/8 ranks in the top 5% of the breed for WW, YW, Milk, Scrotal, Marbling and Ribeye Area! We simply don’t think that you can make them any better and are extremely excited about the future offspring of this elite female. Miss V8 106/8 is one of the favorites of everyone who visits the farm due to her dark pigmented, deep ribbed, big boned and eye appealing look. Of course people appreciate her look but it comes as no surprise with her breed leading pedigree that consists of her sire +Mr. V8 380/6 who produced more show winners from 2011-2017 than any other sire and her dam that is sired by the maternal influencer +Mr. V8 189/4 and the International Champion +Miss V8 143/6. Not only does Miss V8 106/8 combine a stylish look and proven pedigree but also a performance profile that ranks in the top 1% of the breed for WW, YW, and REA. Females like 106/8 are the kind that you build a herd around. We look forward to her progeny out of some of the breeds most popular bulls that should only strengthen this already impressive package. This top young donor that was purchased from the legendary J.D. Hudgins, Inc. combines a popular and proven pedigree with a practical build and production oriented genetic profile. JDH Miss Darlean 420/8 is one of the few daughters still in existence of the National & International Champion, globally utilized and Vanguard Sire (+) JDH Mr. Woodman Manso 578/6. 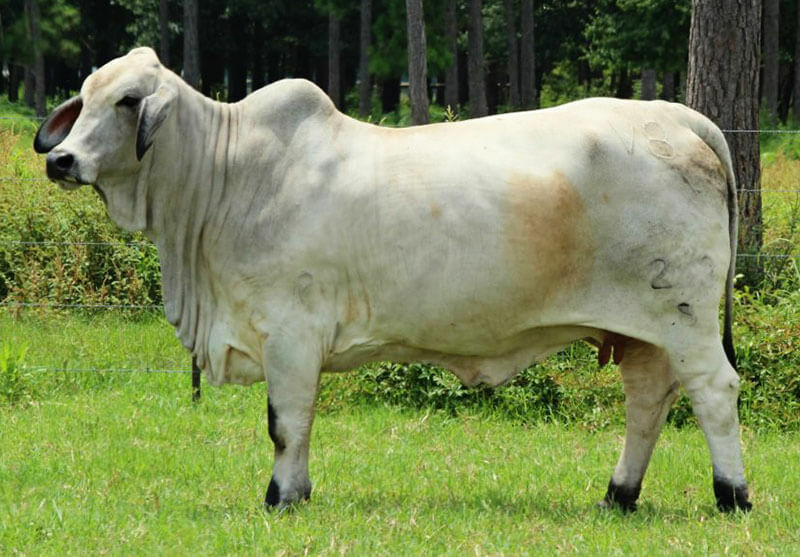 Woodman is known for producing great daughters as well as proven sons such as +JDH Woodson De Manso 206/7. Although it is easy to focus on the proven top side of her pedigree it should be noted that her dam, JDH Ms. Rios Manso 665/6, also produced the J.D. Hudgins Herdsire JDH Fulton Manso as well as 5 daughters that have been retained in the Hudgins Herd. Although we like the popular pedigrees it’s practical cattle with above average performance that drive our program and 420/8 certainly fits that mold being moderate framed , deep ribbed, heavy muscled and ranking in the top 1/3 of the breed for the economically relevant traits of WW, YW, Milk, Marbling and Ribeye Area. 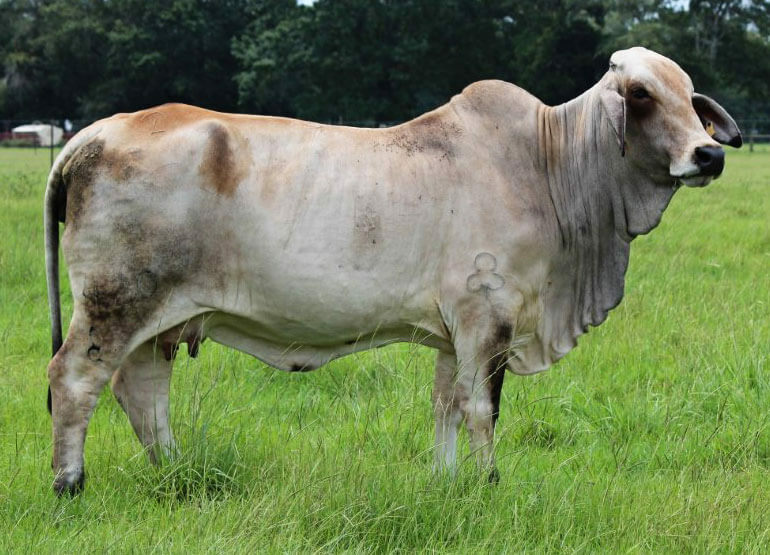 JDH Miss Tessie 532/8 could be used as the ideal Brahman Female with her eye appeal, depth of rib, breed character and feminine look. She is sired by JDH Prophet Manso who we are extremely high on being sired by the legendary Vanguard Sire (+) JDH Lawford Manso 616/6 and out of the International Champion JDH Miss Suzanne. 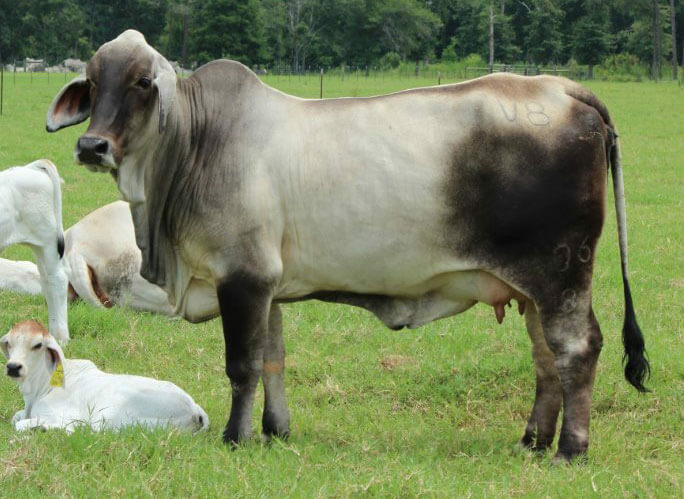 The dam to 532/8 represents one of the top cow families at J.D. 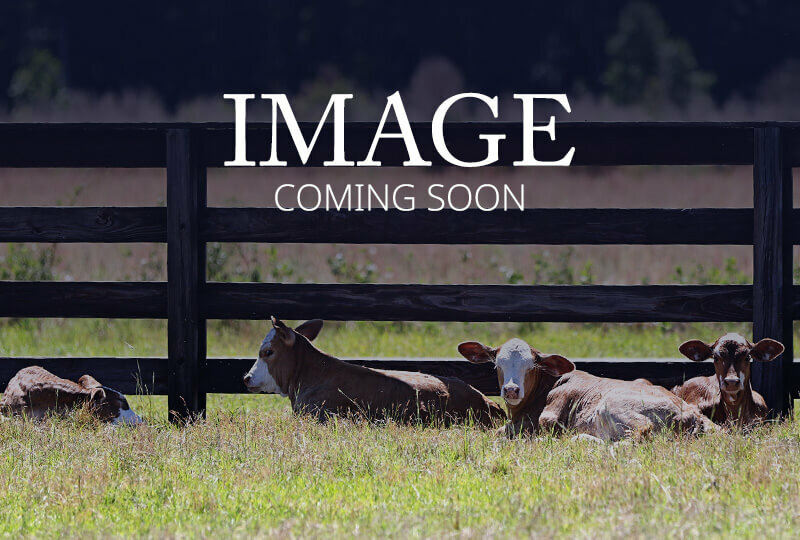 Hudgins that are known for being regular calvers, are in high demand with multiple females being sold both internationally and domestically as well as two daughters being retained in the J.D. Hudgins-Hudgins Division Herd. To complete this impressive package is the performance profile of 532/8 that ranks in the top 5% of the breed for WW, YW & Milk. Just as our other donors we are extremely excited about the future of this young prospect who combines all of the right pieces to be big time! We’d love to show you around Circle F Farms. Give us a call to schedule a time to come see our offering!